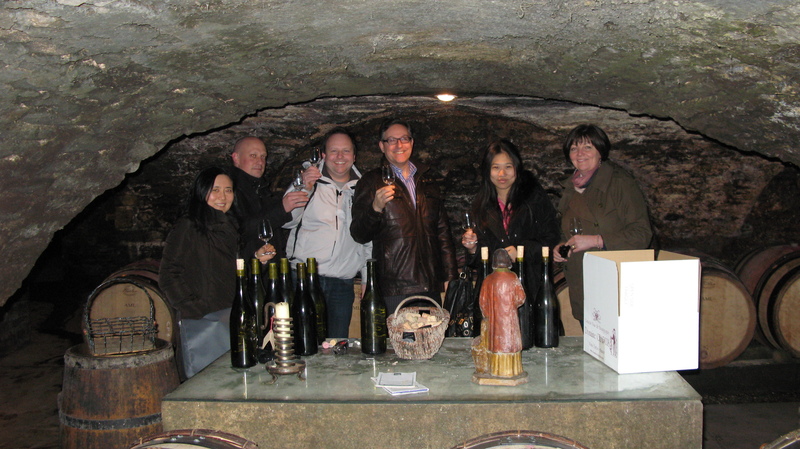 When last years MA Food and Wine Culture cohort visited Dijon it was 20°c and they enjoyed picnics in Beaujolais and walking through the vineyards. This year it was a bit different. Most days the temperatures were in minus figures and snow was not uncommon. So after a day spent in a very warm classroom we reluctantly headed out into the cold for our first experience of the Wine Route. We headed towards Corton and Domaine Maurice Chapuis – a vineyard owned by the family of Claude Chapuis one of our lecturers at ESC Dijon. This was to be the first of many experiences over the week that demonstrated the amazing warmth, kindness and welcoming nature of the people of Burgundy. First, a bit about Burgundy. It is complicated, and that is being nice about it, many of the locals don’t understand the appellation system so I’m not sure how in the space of a week we were supposed to learn it all. Burgundy is made up of four departments – Yonne, Côte d’Or, Saône-et-Loire and part of the Rhône. These are then split into regions – the Yonne has Chablis, the Auxerrois, the Tonnerrois, the Jovinien and the Vézelien. The Côte d’Or from north to south is – the Châtillonais, the Côte de Nuits and the Côte de Beaune. Saône-et-Loire is made up of the Côte Chalonnaise and the Mâconnais. Finally, Beaujolais is in the Rhône. Now within these regions the wines are further classified. There are 32 Grand Crus in the Côte d’Or (Chambertin, Musigny, Corton, etc) and one in Chablis. 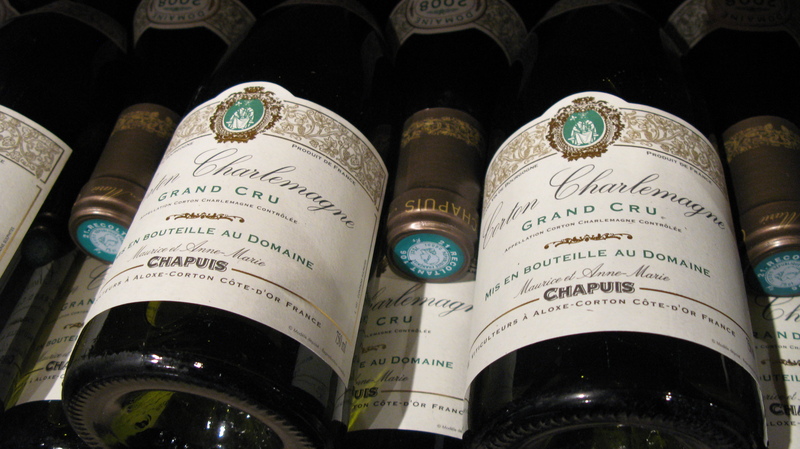 There are 635 Premier Crus (village A.O.C’s that are followed by the name of the Premier Cru climat – for example Nuits-Saint-Georges 1er Cru Les Cailles). Forty four village A.O.C’s (such as Chablis, Irancy and Nuits-Saint-Georges) and twenty three regional A.O.C’s which include Bourgogne, Bourgogne Aligoté and Crémant de Bourgogne. And that is without getting into which side of the National Road the vineyards are and talking about the potato fields. Simple! Now a bit about Corton. It is in the Côte de Beaune area of Burgundy and encompasses the producing villages of Aloxe-Corton, Ladoix-Serrigny and Pernand-Vergelesses. The two Grand Crus are Corton and Corton-Charlemagne. The main grape variety is Pinot Noir although some Chardonnay is grown as well. The Grand Cru of Corton-Charlemagne is for white wines only. The average production of both reds and whites is 464,000 bottles a year. And it is very cold March! A useless pub quiz fact – Corton is from Curtis of Othon who owned the land in the 8th Century and Aloxe is Celtic for hill. Claude showed us around the family property and the winery and after several hints about how cold we were took us down into the cellar which had several statues of St Vincent looking down on us from all angles. Unfortunately the recent heavy rain had flooded part of the cellar but we were still able to taste some of the wines produced by his brother. Several bottles later, we headed to Benoit’s house (another of our lecturers and the chief party animal of Dijon) to continue the tasting along with some of the many local cheese we would try over the week. Claude’s knowledge of Burgundy and its vintages is nothing short of amazing. You could fire questions at him all night and he could answer without missing a beat – he is pure genius and a pleasure to spend time with. Benoit, is also incredibly knowledgable, but is also the reason I have developed a cheese allergy – although more of that in future posts. Although Burgundy is very complicated it was immensely helpful to go to some of the areas and put the knowledge into practice. The plots are so small that having an expert point them out to you and describe all their little nuances it possibly the only way to truly appreciate the wonder that is Burgundy.